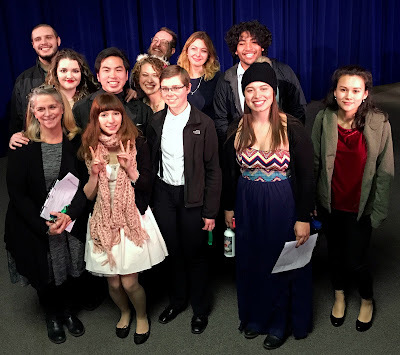 You have a choice of daytime or evening on Tuesday to hear the vocal recitals of music students at Shoreline Community College. The recitals are free and the community is encouraged to attend. Shoreline Community College Voice Class students will present their final performance for the winter quarter. Students choose their own solo to perform. Music selections range from present-day composers to Early Baroque pieces. Small vocal ensembles will also perform pieces they’ve worked on together. Students have been working hard to develop their stage presence, as well as their vocal skills. For some, this will be their first attempt at singing in front of an audience, so we've created a very encouraging environment to support them. Performers are always energized by appearing in front of an audience, so we hope to fill the room with supportive faces! This event is FREE and everyone in the community is welcome to attend. Students taking private vocal lessons have been working hard all quarter to prepare for this event. They will perform a selected piece before a jury of vocal instructors who will evaluate their performance. Students hope to receive an Outstanding Performance acknowledgement or an Honorary Performance acknowledgement. Outstanding Performance students will later perform their winning piece at an Honors Recital. The audience at jury examinations is often comprised of music faculty, friends and family members of the performers, as well as, fellow vocal students and members of the community. Everyone is invited to attend. Admission is free.